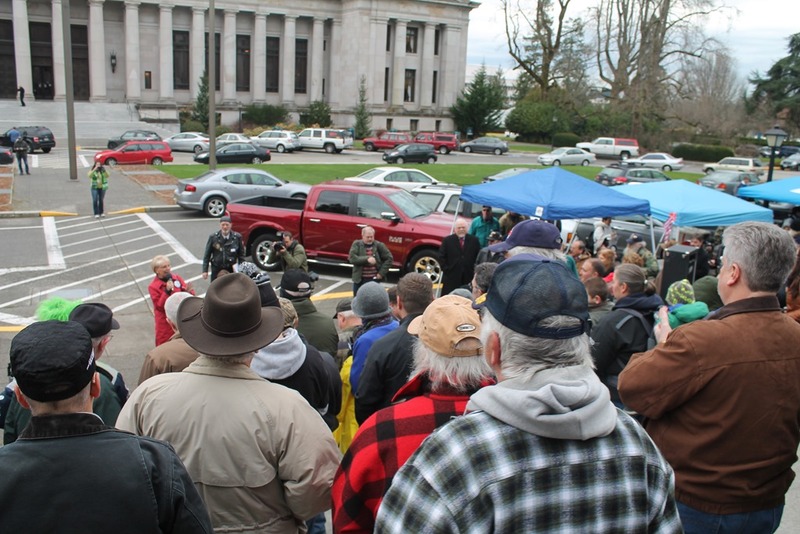 Sean Flynn and I woke up at an obscene hour this morning and drove to Olympia Washington for the rally to oppose I-594. As you might imagine from the number of QOTDs he has provided and the numerous posts that mention him it was a pleasure to have him as a companion for the drive. At the rally last month I didn’t talk to anyone and only recognized Mike Vanderboegh (his thoughts on today’s rally are here). 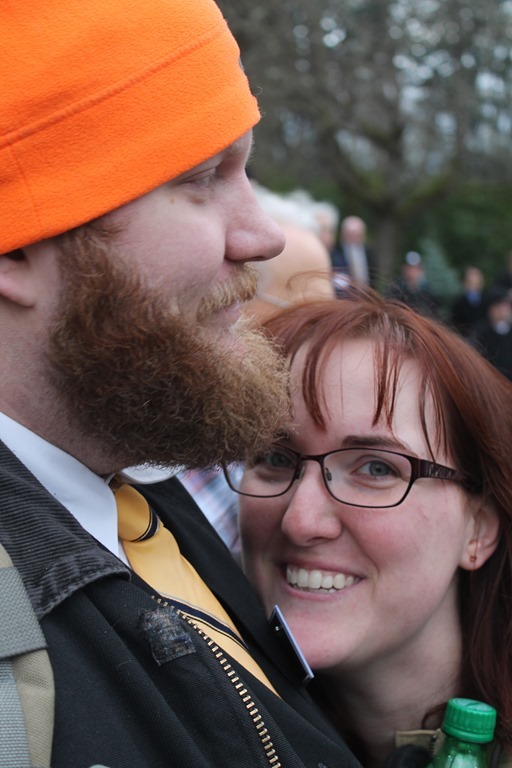 This time I saw and talked to a number of people including Barron and Janelle, Gay Cynic, Dave Workman (I didn’t really talk to him, just nodded “Hi!”, his thoughts on the rally are here), Anette Wachter and Charles, Alan Gottlieb, Brian Keith, and numerous other people I recognized. I believe my speech went okay. 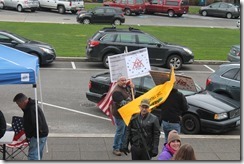 Joel Connelly from the Seattle PI made mention of me in his blog post about the rally. He said I was “from a group called Boomershoot” which doesn’t really make any sense, but did correctly note I quoted Any Rand from Atlas Shrugged and The Virtue of Selfishness. I suspect he intended that to mean that I could be dismissed without further thought because in a couple sentences he said, “About the day’s only reflective remark came from State Rep. Brian Blake, D-Aberdeen, a Democratic legislator who actively opposed I-594”. Brian Keith told me my speech got a bigger response than all the speeches prior which was my impression as well. I’m nearly certain there was only one speech after mine that got a bigger response from the crowd. The text of my speech is “below the fold”. If you are a regular reader of my blog there isn’t any new material here. Me giving my speech. Photo by Sean. Some of the LGBT contingent. 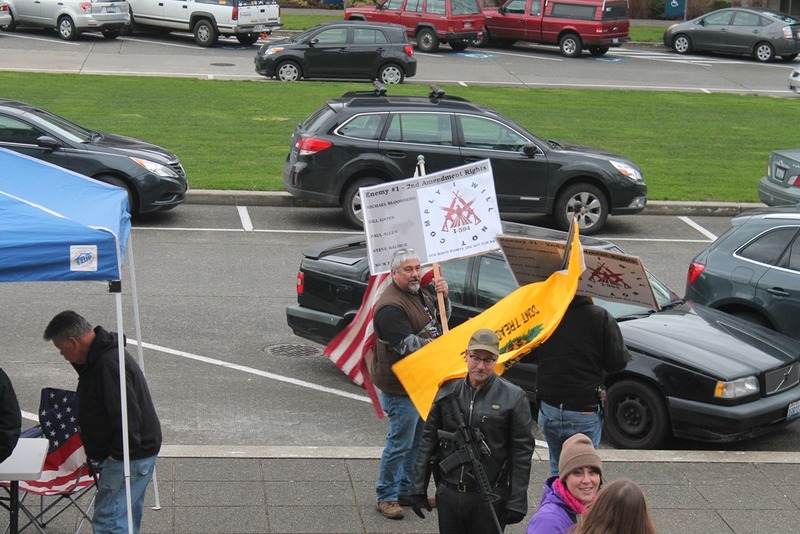 Some of the I will not comply contingent. After the rally I visited the offices of my representatives then attended a luncheon with other activists and some lawmakers. 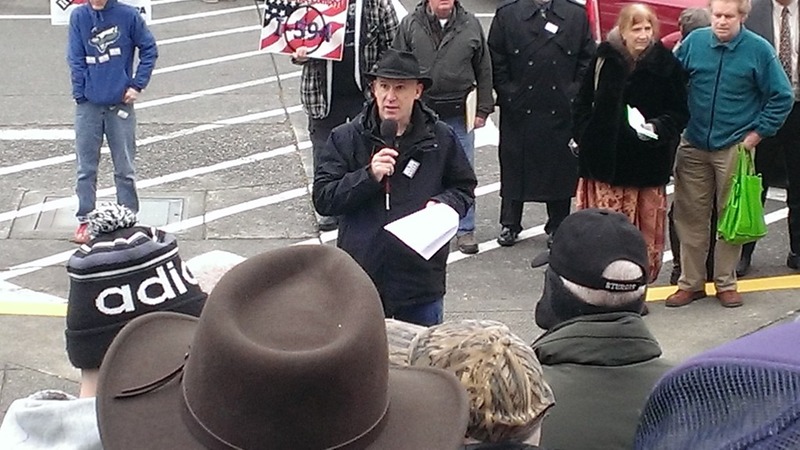 Speech written and delivered by Joe Huffman at I-594 rally in Olympia January 15, 2015. The claimed purpose of background checks is to prevent “people who shouldn’t have guns” from acquiring them. This is a noble objective. It sounds so reasonable and “common sense” that I want to agree without giving it even a seconds thought. It’s such a great idea I think we should apply that to some other dangerous things. Let’s have “background checks” before people can purchase recreational drugs. Keeping recreational drugs out of the hands of people that would likely abuse them is just “common sense”. Right? Oh! That’s right. We have something way beyond background checks in place for most recreational drugs. Our governments have banned them! How long does it take the average high school dropout to find a way around the ban? They probably can get all the recreational drugs they want within an hour anytime of the day, any day of the week. So how effective you think a “background check” would be in reducing the abuse of recreational drugs? Now apply what you know about recreational drug laws to firearms. If the intention of background checks is to prevent the abuse of firearms by “people who shouldn’t have guns” it obviously will be, and is, a total failure. But you can’t really fault them for their good intentions, right? 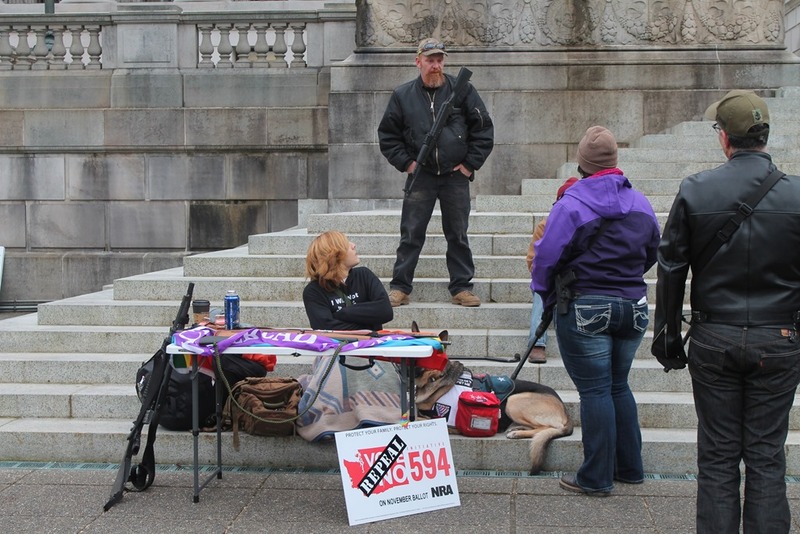 For the moment let’s drop the intentions of those who promoted and voted for I-594. 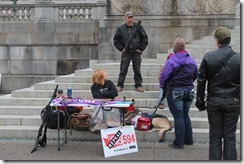 What was the intention of those who wrote I-594? But what does “kept at all times” mean? Does this mean for the duration of the transfer? Or does it mean the gun stays at the range until the end of time? We might be able to rule out “until the end of time”. But it could easily be interpreted as only applying to rental guns. Notice the different language used? Had they intended for the first exemption to mean “the gun must not leave the range while in use by your friend” they would have used the other language. But they didn’t use that language. They said the gun must be kept at the range at all times. Their intention is that it be a rental gun, not a gun loaned to a friend for a few minutes. It appears to me that loaning a gun to a friend for a few minutes is not exempt from a background check. One could argue that I am giving them too much credit. Maybe they weren’t smart enough. Or maybe they didn’t have the skill to use clear and consistent language. Maybe we can’t infer anything about their intent because these people are just simpleminded, good intentioned, fools. I-594 was sponsored by people willing to spend millions of dollars for its success. Do you believe they would invest millions of dollars in the election but hire incompetent lawyers to write it? Or is it more likely the authors of this initiative were deliberately deceptive? I claim the appropriate conclusion is the people who wrote I-594 want you to be in fear of going to jail every time you look at your gun. If I-594 were a law infringing upon our rights to free speech or freedom of religion nearly everyone would get it. Somehow our good intentioned opponents don’t or can’t understand this. “Books don’t kill people!” they will say. Ideas are far more dangerous than tools. The Communist Manifesto, Chairman Mao’s Little Red Book, Mein Kampf, and even religious books propagated the ideas responsible for the murders of over 100 million in the 20th century. Yet we still recognize freedom of speech and freedom of religion are more important that the dark side of infringing these natural rights. The connections between the First and Second Amendment are easy to make and very strong. When you talk to your friends, relatives, neighbors, and legislators make this connection. Let them know we are demanding our specific, enumerated, inalienable rights be respected. Just like our First Amendment rights. The truly and deliberately evil men are in a very small minority; it is the appeaser who unleashes them on mankind; it is the appeaser’s intellectual abdication that invites them to take over. When evil wins in the world, it is only by the default of the good. That is why one man of reason and moral stature is more important, actually and potentially, than a million fools. I suspect evil people wrote I-594. 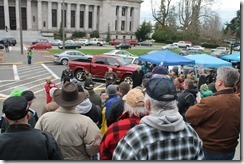 I know I-594 had over a million good intentioned fools and appeasers vote for it. But we have hundreds of men and women of reason and moral stature here today. We are standing up against evil, fools, and appeasers. We must act reasonably and morally to defeat the implementation of I-594. We must not let evil triumph. So the moral of the story is to dress and act like an ordinary person so as to not give them any photo ops of weird people. Maybe it should all be hunting rifles since the AR and similar designs are so eye-catching for the anti-liberty shills. I don’t believe it is right to redesign ourselves in response to hostile stereotypes. If we do, who’s in control? Who’s leading and who’s following? Who is responding to whom? No, Young Grasshopper, evil will continue to be evil, and more so, if we try to respond to it in any way other than directly. Listen to the edited recording of the Zimmerman 911 call, compared to the real thing, and tell me there was anything he could have done to prevent being stereotyped. Be reasonable of course, be good, be cool, be articulate, but don’t try to redesign yourself out of fear of evil stereotypes. Learn how to force the evil ones to explain THEMselves, worry about how THEY look, and so on. Then they’re on the run, and not you. AND LETS STOP WORRYING about how we are being falsely depicted in the press. We ARE the press ourselves. Relish the thought of being so falsely depicted that once the truth is out the evil reporter is left back-pedaling and squirming like Dan Rather. They’ll still have followers. But only the worst of the worst followers, and they richly deserve those followers, and then we know exactly who’s who. Wants not to like about that? It’s perfect. And good trigger discipline, even in the “inflammatory”pictures. The pics you have as stated as part of the LGBT contingent weren’t actually with us, they were are part of the “I will not comply” group. Paige, of Seattle Pink Pistols, was there, and spoke, along with a few others but those in the pic were a part of the problem children that created the mess. I’ll be writing up my post on the topic tonight with a few other bits I caught. Joe, your speech is excellent. It isn’t “reflective” in any way whatsoever (that is, if we are now to define “reflective”, as did Joel Connelly from the Seattle PI, to mean; “in agreement with Progressives and Progressive/socialist/authoritarian motivations, ideologies and goals”).